In some areas od Poland people are disconnected from the electrical grid by the weather. A lot of hard rime covered electrical lines and caused some pylons to break. It is not uncommon in Poland to have temperatures below -20°C (-4°F). But such weather with very high humidity is not something we would expect. Because of such unusual weather conditions, for over 10 days more than 30,000 people don’t have electricity at their homes. And if you are not prepared, it is a disaster for a typical polish house. We don’t use electricity for room heating (except for very modern buildings, like passive houses), but it’s needed to power some equipment used in central heating, like water pumps and controllers. So in cold winter lack of electricity means not only lack of light, tv and computer, but also wearing thick clothes. Even more difficult it is for people who use electricity for cooking, and since modern electric kitchen stoves are becoming more and more popular, we should expect at least 10% of those 30,000 to be both cold and hungry. My apartment doesn’t have natural gas supply, so we cook on electric stove. If we didn’t have electricity, we would have central heating supplied by our local heating plant, but we would have to cook on a gas stove in my camper. 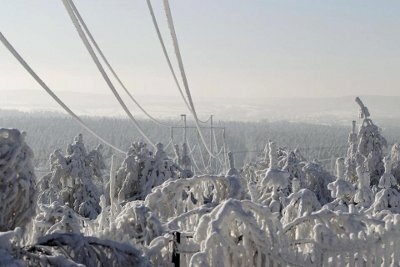 The photo (by Mariusz Skwarczek) clearly shows the deposit of hard rime on the electrical lines, and tree branches.